Desktop CPU in a laptop form factor. Eurocom's latest laptop, a term we use loosely here, blurs the line between what it means to be a notebook versus a desktop. 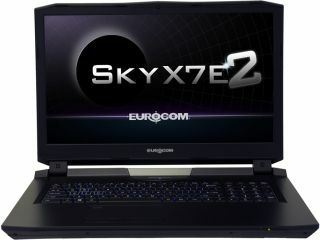 The Sky X7E2, as it's called, is a 17.3-inch desktop replacement that tips the scales at over 8.5 pounds (3.9kg) with a 1.6-inch waistline. Why would you need something so comparatively big and bulky? The Sky X7E2 is designed for VR gaming in a technically mobile form factor without the performance penalties that sometimes accompany a laptop. To start with, it rocks a socketed desktop LGA1151 Intel Core i7-6700K processor. You can pair the processor with up to 64GB of DDR4-3000 RAM (4x16GB) and your choice of three Pascal-based graphics cards: GeForce GTX 1060, 1070, or 1080 (all MXM 3.0 slot). The GeForce GTX 1080 is overkill for the base model's Full HD 1080p (1920x1080) display, though you can upgrade to a 3K resolution TN panel or 4K IPS screen. Beyond that, the Sky X7E2 supports up to 5TB of storage space with four drive bays, which are equally split between SATA 6Gbps and M.2 PCIe Gen4. Other features include a 6-in-1 memory card reader, Killer E2400 GbE LAN, M.2 WLAN/Bluetooth support, Sound Blaster X-Fi MB5, two USB 3.1 Type-C ports, three non-powered and one powered USB 3.0 ports, two mini DisplayPorts (1.3), an HDMI 2.0 port, and a backlit keyboard. Pricing starts at around $2,100, though if you deck this thing out with all the amenities and upgrade options, you can easily run north of $5,000. The Sky X7E2 is available to configure and order now.